The key to a successful inserimento is providing both flexibility (to accommodate individual differences) and consistent, dependable routine (so children know what to expect). 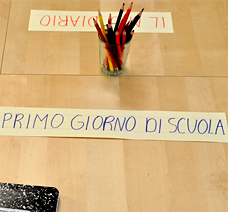 Teachers at La Scuola will be as sensitive as possible to your family’s unique needs and will work closely with parents and caregivers to coordinate an inserimento strategy for each child. Talk about school (but not too much). Give specific information (teachers’ names, toys, activity areas, routines of the day). Emphasize that you will always come back to pick you child up from school. Acknowledge whatever feelings your child may show. Tell your child that sometimes it’s a little uncomfortable to do new things, but that you are sure that before long, school will be familiar, for both of you. Characterize school as a place where children have fun and enjoy playing together. Remain as unobtrusive as possible without being cold. Give specific feedback to your child, in Italian preferably. Don’t talk with other parents (keeps the volume low and the focus on the children’s activities). Ask a teacher for a job if you want to keep busy. Be available to your child if s/he really seems to need you. Wait for a cue from a teacher and always alert the teacher when you are leaving. Always say good-bye to your child. Acknowledge the feelings your child is showing (it’s okay to feel sad or angry). Remind your child that the teachers will keep them safe and help them feel better. Try to remain confident yourself / do not deny your own feelings, but emphasize your confidence that soon goodbyes will become easier for both of you. Make a clear, definite departure, even if your child protests. Do not remain in the hallway or re-enter the classroom. Don’t loiter in front of the school. If you want an update on your child, call us!